I might have been raised in a quaint Derbyshire village, but industry was never too far away. Within walking distance was the huge Stevenson’s Dye Works on Bullbridge with its mysterious deep water reservoir which was rumoured to have swallowed up animals and small children over the years. Almost adjacent was the eerie Gas Plant, and then looking over the A6 towards the River Derwent was the Wireworks, where crashing and banging could be heard long into the night. A few miles away was Belper, where a weekly visit was made to see relatives, and it was in Belper that you could look in awe at the Sewing Mills, smell the fumes from Silkolene and wonder in amazement at just what was running through those huge tubes at Deb, Swarfega probably! I was fascinated by these places, fascinated by the mystery. Just what was going on behind those locked gates, those high fences, and inside the cavernous tall buildings. As smoke and vapour rose into the air, just what were they concocting? To me, they were like huge science labs, mazes in fact, where you could get lost, and of course, get up to all kinds of mischief. As years went by, these places vanished. The Dye Works was demolished, the Gas Plant lies virtually derelict, the textile industry has left the area, Silkolene closed, Deb relocated and the Wireworks is redeployed for what now I’m not sure. But, those formative years had an impact, to the point where I do love the sight of some industry, especially traditional industry, with chimneys, towers and the like. It was twenty years or more now when I was traveling back from North Wales along the M56, and just as Frodsham appears on right and the road crosses the River Weaver, it was in the twilight sky that I caught sight of Weston Point in Runcorn. In simple terms, it is an area of land that arcs round from the Weaver estuary where it joins the Mersey, right round to the edge of the Runcorn Bridge. The area was dominated by the huge ICI works, but to look at it, it’s a marvellous sight as the sun starts to set, with its towers and lights dominating the vista. I found myself mesmerized by the sight, and in more recent years, flights from Liverpool Airport would ordinarily take me via the Weston Point Expressway, and that again was a chance to get closer to the fascination that lay below to the left. Work did start to take me to Runcorn Town Centre from time to time, and it was during a lunch break that I’d wander down to the banks of the navigation canal. I’d sit on a bench in the nature reserve staring at the bridge. Opposite was Widnes and Spike Island, where I saw the famous Stone Roses gig. Football in Runcorn was a really big deal once in a while. Runcorn FC at one point were arguably the top non-league club in the country, by the time I visited in 1995 they were on the decline, and then when the old Canal Street ground was sold and the club became nomadic, the end was nigh. I saw them again as Runcorn Halton playing at the Widnes Rugby League ground, but ultimately the club folded before being reformed as Runcorn Linnets. They now finally have a ground of their own in the town and ply their trade in the North West Counties League, with this season looking increasingly like the one where they win the league and gain promotion to the Northern Premier League. Around the time Linnets were formed, a team called Mond Rangers in the West Cheshire League changed their name to Runcorn Town. In 2010 they were accepted into the North West Counties League, and suddenly interest in them started to build, mine included. Very quickly after doing my research it became clear that this Runcorn club was not just any old club, they were a club plying their trade in Weston Point, smack in the heart of the industrial landscape that had fascinated me. 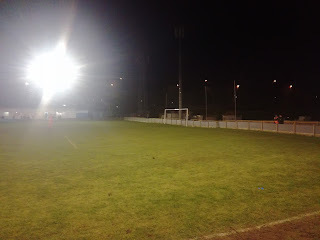 A pre-season friendly against Newcastle Town on a warm July evening was my first visit, situated at the Pavilions Club, it was a ground hemmed in between the Weston Point Expressway and the caustic soda plant. 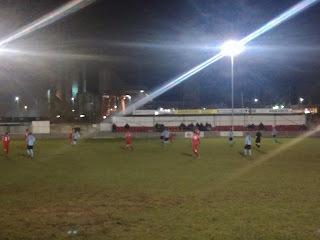 I had a great evening, at a characterful ground, watching a good team, with great scenery as the backdrop! 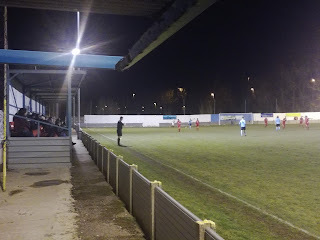 I followed the clubs fortunes, they were promoted in their first season and then once in the Premier Division in three successive seasons they ran promotion to the Northern Premier League close. The first two of those three seasons finishing above the Linnets, which wasn’t bad for a ‘Small Team From Weston’ as they were referred to! A couple of lean seasons followed, but last year they finished third, with Linnets fourth. This time around Linnets should win it, but Town are locked in what appears to be a three way battle with Charnock Richard and neighbouring Widnes for the second promotion place. 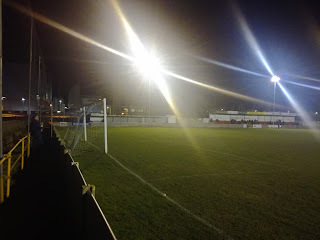 Tonight, Town were playing Blackpool based Squires Gate, complete with Trevor Sinclair within their ranks, albeit named as an unused substitute. The league table suggested a home win, but more on the game later. The ground, from memory, had changed a little from 2010. A new seated stand adorned the West side, alongside the original cover, while the club house looked to have been spruced up. Next to the club house sits another area of cover that appears to be a work in progress, while behind the South end of the ground below the bank is what looks like a new turnstile block. The ground is a mixture of structures, but it has a charm and an individual identity, something you can’t say about many places that would probably consider themselves to have better facilities. 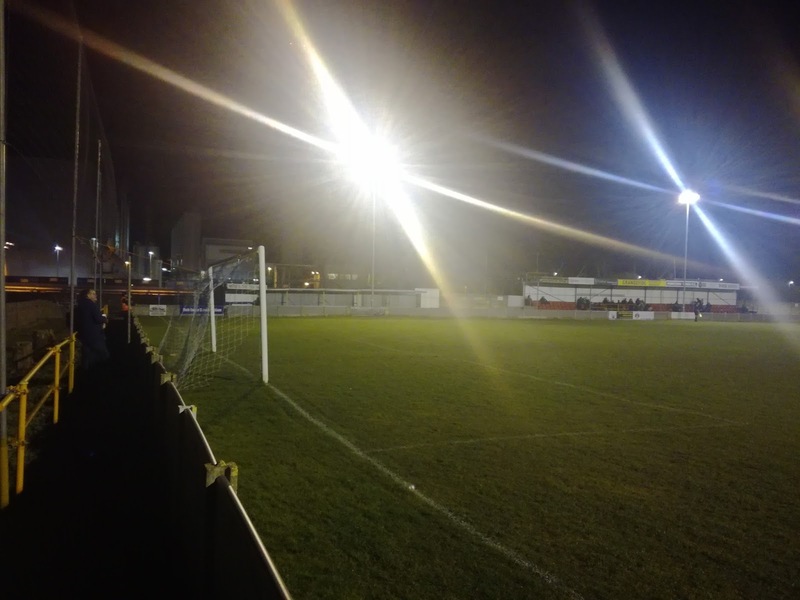 The welcome is incredibly friendly, the club is blessed with a number of volunteers, and as a neutral looks to be very well organised and professional in what they do. The programme is first class, while their web presence and social media are both excellent. If they do make the NPL, they will be a very worthy addition. A crowd of around 100 assembled to watch a game that Runcorn should have won. But, despite having enough chances to have won a number of games, they came up against a Gate side that defended heroically, rode their luck at times, but ultimately when chances came their way, they were clinical. 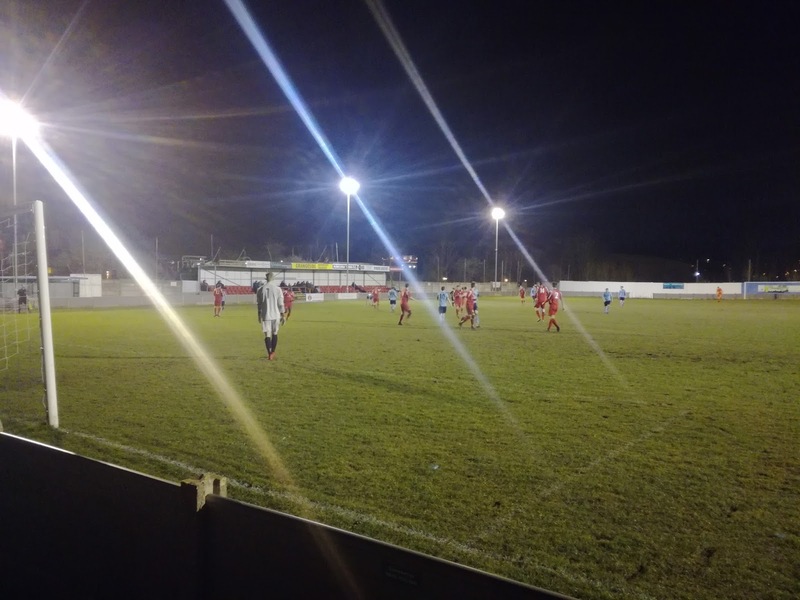 Runcorn made errors that proved costly at both ends of the pitch, while they might argue that they had two justifiable penalty claims turned down. On another day they would have won at a canter, but sometimes football is a bit like that. Gate scored once in each half, before Town reduced the arrears with the last kick of the game through Craig Cairns. The experienced and prolific Mark Reed had chances but again, could not find the back of the net. Town will go again, but no denying this was a setback. It’s incredibly tight at the top, and I wouldn’t like to predict the outcome. The landscape of Runcorn is ever changing, the new Mersey Gateway Bridge dominates the area, while the traditional Runcorn Bridge is out of action. The road network has been revamped accordingly while Weston Point starts to see the traditional industries being replaced by the more contemporary. My drive away from the ground saw me weaving under the cranes and over the railway tracks, but how long will they remain? In footballing terms, after years in the doldrums, the town could be on the verge of something special. For Runcorn Town, that would be an achievement worth celebrating, and I'll happily join them, make mine two pints of lager, and a packet of crisps, please? A good read, but some inaccuracies in there. 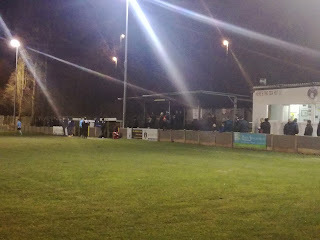 Runcorn FC didn't reform as Linnets, a supporter's group broke away from the now defunct club while the old Runcorn FC was still going (although on the slide) and set up Linnets. It's not the same club, in the same way that 1874 is not Northwich Vics (difference being that Vics are still around). Great read. A true appreciation of what Grassroots footy means to those involved.